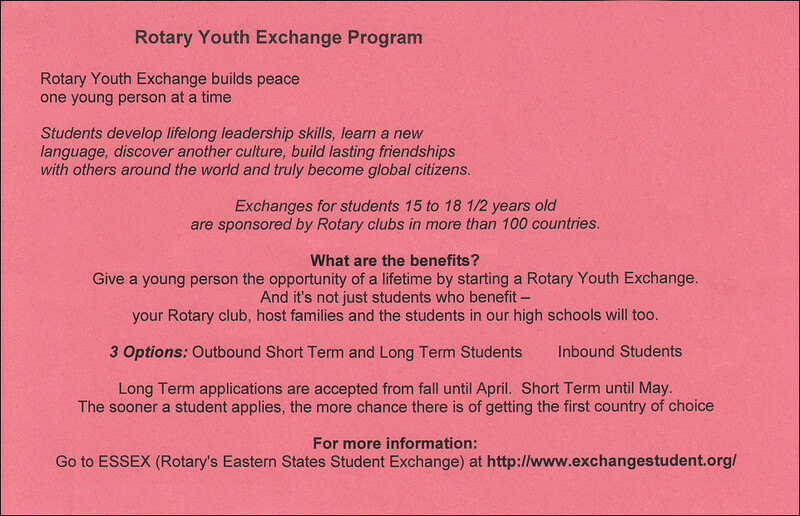 How would you like to help build world peace and understanding - one student, one exchange at a time? Do you know a high-schooler who might be ready to take on a life-changing adventure? Ready to move outside their comfort zone and embrace the tremendous personal growth that comes from it? Rotary Youth Exchange advances one of Rotary's key areas of focus, with several thousand teens immersed in another culture for a year, living with families and studying at a local school. Over and over, students say going on exchange changed their lives for the better, made them more confident and independent, helped them see the world and people with greater understanding, acceptance and respect. And they bring that home to share with their families, their schools and their communities. 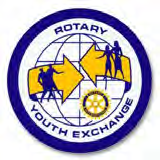 The Rotary Youth Exchange program is considerably less expensive than other exchange programs, largely because it is run entirely by Rotarian volunteers. The student’s family will be responsible for airfare, a re-quired health/travel/liability insurance policy, visa, and an application fee. However, these expenses are somewhat offset by not having to feed the teenager for a year! Our District has a modest scholarship fund. It was created by Hal Malone and his family because Hal was sponsored by the Rotary Club of Johnson City (where his father is still a member!) in 1990 to spend a year in Ukraine - a year that changed his life and opened professional and personal opportunities that affect him to this day. The fund pays for part of the application fee, and can help families in need with other expenses to a limited extent. Students must be between 15 and 18½ (19 for some countries) as of August 1, 2017. And yes, they can be children/grandchildren of Rotarians. The applicant must be sponsored by a District 7570 Rotary Club. 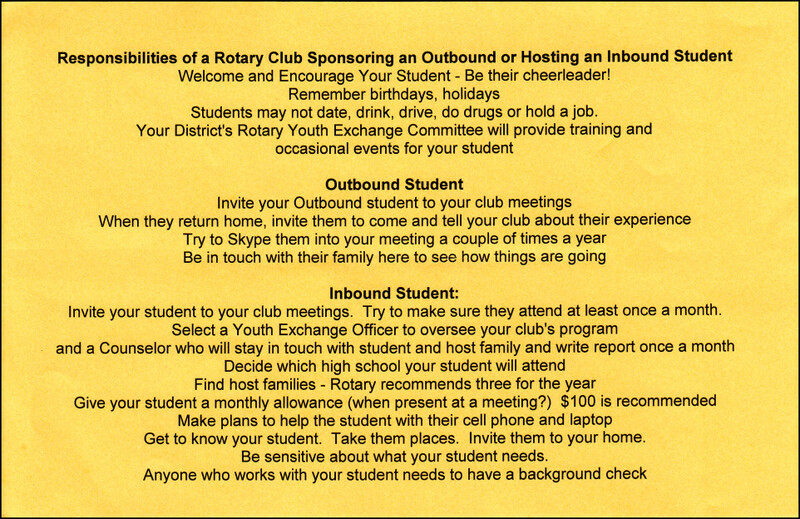 There is no required financial obligation for the club beyond having the student and family attend some club meetings. Applications for the 2017-18 school year must be submitted in the next couple of weeks. It takes a while to complete, so encourage your young person to start now, and to contact Tom DuVal (rye7570@gmail.com) for more information and assistance. We also have a wonderful short-term exchange program, usually during the summer months. If you want to know more about that, contact Tom DuVal (rye7570@gmail.com) or Ambre Torbett (ambretorbett@gmail.com). Our sincere thanks...you have helped him grow not just as young man or athlete or what-have-you, but overall, as a better person and human being.